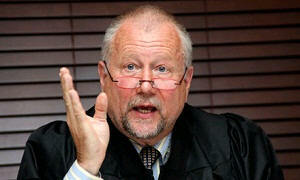 Professor Peter Erlinder is an international criminal defence attorney, human rights lawyer. and former prisoner in Rwanda, who is still wanted by the Rwandan government of President Paul Kagame, for disputing its official history of the Rwanda Genocide. In January, he began a speaking tour of the US, which coincided with DePaul University’s Journal of Social Justice’s publication of a selection of original UN documents and evidence supporting his analysis of what actually happened at the time of the epic massacres now widely known as the Rwanda Genocide. His presentation drew on his experience as a UN-ICTR defense lawyer and as a Rwandan prisoner. When Professor Erlinder was in New York City to speak at several universities, and the Brecht Forum, I interviewed him about how the US manipulates the international criminal tribunals, including the International Criminal Court (ICC) and the International Criminal Tribunal on Rwanda (ICTR), and how this affects the people of East/Central Africa, in particular. Erlinder explained that the ICTR has become a victor’s tribunal serving U.S. geo-political interests and that it therefore impedes reconciliation between African peoples of the region, and how this may affect the long-term interests of the American people. We also talked about the UN documents which formed the basis of his new publication, and about his life altering experience as a prisoner in Rwanda. Peter Erlinder was President of the National Lawyers Guild from 1993 to 1997, and he has served as President of the Association Des Avocats de la Defense (ADAD), the UN-ICTR defense lawyers associations in Arusha, TZ. He is a founding member of the National Coalition to Protect Civil Freedoms and the Minnesota Bill of Rights Defense Coalition, established to defend the civil liberties of Muslims. He pioneered defense of Vietnam Veterans with PTSD facing the death penalty, and has represented many Native American, civil rights, and political activists facing misuse of government power, including Palestinian activist Dr. Sami al Arian and the Cuban-5. In May 2010, he was imprisoned in Rwanda while defending Rwandan presidential candidate, Victoire Ingabire, and charged with “genocide denial” for having won the acquittal of his ICTR client on “genocide conspiracy” charges. Many groups, including the National Lawyers Guild, the American Bar Association, and members of the U.S. Senate and House, and an international grassroots campaign called for his release, which was granted on June 17, 2010. Erlinder then returned to his position as a tenured professor at William Mitchell College of Law, in St Paul, Minnesota. He has also held faculty positions or lectured at the law schools of the University of Chicago, IIT Chicago-Kent College of Law, Golden Gate University, Waseda University, Hitosubashi University, the University of Wisconsin, the University of Illinois, Columbia University, and American University. He has organized and stored his evidence relating to conflict in Rwanda and the Democratic Republic of Congo in The Rwanda Documents Project an online archive for UN documents relating to conflict in Rwanda and the Democratic Republic of Congo. Professor Erlinder fails to mention that the UN had the Gersony Report to the UNHCR of October 1994 revealed that the RPF was committing systematic massacres of Hutus beginning in April 1994 or that the RPF committed all the massacres of civilians between 1990 and 1994.That document and that evidence was exposed in several trials including the Military II trial in 2008 along with a letter from Kagame dated August 1994 talking about the plans he and Museveni and their American, British and Belgian collaborators had for Zaire. He also fails to mention that there is testimony at the ICTR that the American Air Force supplied men, arms and materiel to the RPF in 1994 using C130 Hercules, (and there is evidence of the Canadians doing the same) and we know the Rwanda Emergency Office was staffed by US military personnel and acted as the operational headquarters for the RPF. He also fails to mention that the UN forces under Dallaire actively helped the RPF prepare for the RPF offensive in 1994 and helped to shoot down the plane carrying the two Hutu presidents and that the UN handed over their positions and their materiel to the RPF and, just as we have seen in Cote D'Ivoire, actively fought on the side of the RPF. it is not possible that the US State Dept and the US Army were not acting under the same orders. it is clear that they were. As Boutros-Ghali said, "The Americans are 100% responsible for what happened in Rwanda. " Dallaire did not ask Kagame why he did not use his forces to stop the killings because Dallaire was an active partner with Kagame. The question is why Dallaire did not stop Kagame's forces from breaking the Arusha Accords.The answer is clear because the US, Canada, Britain, Belgium wanted the Rwandan coalition government destroyed so they could install their puppet, Kagame. Defence counsel in the military trials, the government trials and the media trials have all obtained the UN documents, RPF documents etc that show what really happened and all defence counsel in those cases have exposed these things at risk to themselves. Several counsel have been declared "enemies of the state" by the RPF, including this writer. Several have been threatened by the RPF and CIA. He is not alone in this. It is important for people to know that this intimidation is widespread and not particular to him.